We have some exciting new technology in our office! 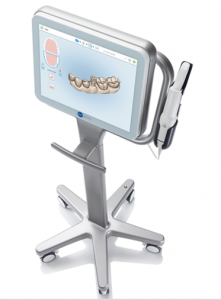 It is the Itero digital intraoral scanner. Kind of a fancy name. So what does it do? 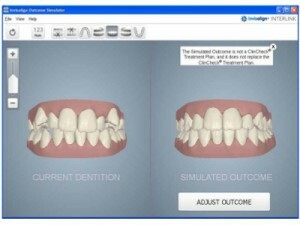 The Itero scanner takes the place of taking impressions (molds) of our patients. Most people have either had or know what a dental impression is. There are many types of materials used to take impressions, but they all function basically the same. 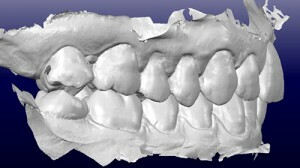 An impression tray is fitted to your teeth, then the impression material is mixed and placed within the tray. This tray is then placed in the mouth. This is where the problems start. All impression materials are semi-solid, some almost liquid when placed in the mouth. The material flows around the teeth, gums, and jaw bones and makes a mold of them. There is very little control of the flow of the impression material, so some amount of the material flows out the back of the tray and towards the throat. For anyone that has trouble with gagging, you know what that means. 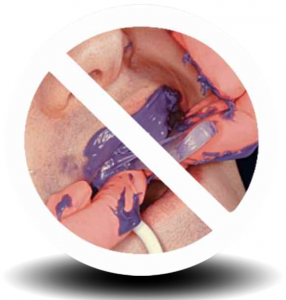 The material causes the patient to gag! The tray has to be held in the mouth anywhere from 1-2 minutes to several minutes, only making it worse. The Itero scanner can eliminate all of that mess and gagging. The scanner uses a handheld scanning wand that contains a computer controlled digital laser scanner, which in some ways is like the bar code scanner at the grocery store. 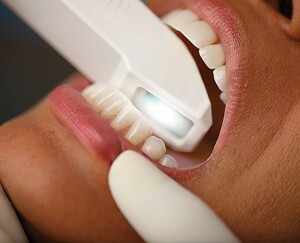 Instead of the runny, messy impression material, a comfortable laser scans your mouth and produces a digital mold. So much easier. What are some of the other problems with traditional impressions? They are no where near as precise as the laser scanner. During the scanning process, the computer actually shows us areas where the scanner missed, allowing us to simply move the wand to a different angle to scan the missing area. When you take an impression, the inaccuracy (missing/distorted areas) is often times not found until the impression is poured in plaster in the lab, after the patient has left. That means the patient has to come back for another impression. And even if the plaster model looks good, there is still some amount of inaccuracy of the mold which can compromise the fit of whatever appliance is being made from the model. Because the “model” is digital, it can be used over and over again with no damage to the “impression”. Most traditional impression materials are “one time use only”, meaning they get damaged beyond use after the first time a plaster model is made from them. So if the lab has a problem with the plaster model (they drop it and break it, for instance), the patient has to go back to their dentist for a new impression. Because the digital scan is transmitted over the internet to the lab, the turnaround time is much quicker than mailing an impression to the lab. The Itero scanner also has a really cool feature called “The Smile Simulator”. Within about 10 minutes, we can scan your teeth and show you an estimation of what your teeth will look like after treatment. It can really help make the decision to go ahead with treatment much easier. The Itero scanner will allow us to, over time, replace the messy, gag inducing, impression taking in our office with a quick, comfortable, and very precise digital scan. At Flanagan Orthodontics, we are always striving to provide our patients with the highest quality and most up to date treatment. The Itero scanner definitely fits that description!